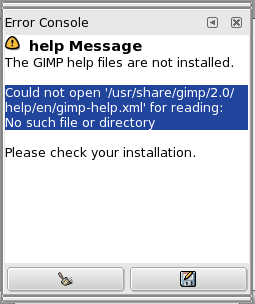 The Error console offers more possibilities than the single “GIMP Message”. This is a log of all errors occurring while GIMP is running. You can save all this log or only a selected part. The “Error Console” dialog is a dockable dialog; see the section Section 2.3, “Dialogs and Docking” for help on manipulating it. from the Tab menu in any dockable dialog by clicking on and selecting Add Tab → Error Console. This button lets you delete all errors in the log. You can't “undo” this action. This button lets you save the whole log. You can also select a part of the log (by click-and-dragging the mouse pointer or by using the Shift+arrow keys key combination) and save only this selected part by pressing the Shift key. You will as well find these button actions in the dialog tab menu by clicking on , or in the context menu you get by right-clicking on the dialog window.